THERE WAS ONE story that caught the eye of Kilkenny hurler Jackie Tyrrell recently. He read with interest about the daredevil antics of the two Irish lads who snuck into the Superbowl and ended up sitting in $25,000 seats. Tyrrell and Kilkenny team-mates Eoin Murphy and Paul Murphy are keen American Football fans. And on his holidays to San Francisco recently, Tyrrell drew gasps from locals as he drove 45m frees over the bar at the new Levi Stadium, home of the 49ers. He laughed: “Ah a few contacts there! One of the Irish guys over there, his son was a security guard with the 49ers. We rang and asked him to see if we could get down. He brought us in and said to bring a few hurls so we had a puckaround on the pitch. It was good fun! Tyrrell then found himself fielding questions from interested onlookers, eager to find out exactly what he was doing. “It was ‘what’s this’ and all that. I had to give them the usual speel. We told them to Youtube it so they’re gone off to dig deeper into it. Tyrrell’s fascination with the NFL dates back to his days living with former Cork star Kieran Murphy, when the pair hurled together with Limerick IT. It was a month to remember for Tyrrell on his travels in the US. While on the Kilkenny team holiday to Miami, he found himself playing headers in the pool and beach volleyball with former Holland and Manchester United goalkeeper Edwin Van der Sar, as you do! If he’s looking for a way to get in, perhaps Jackie could contact Richard Whelan and Paul McEvoy for some advice! Email “Kilkenny star Jackie Tyrrell is in awe of the Irish Super Bowl blaggers”. 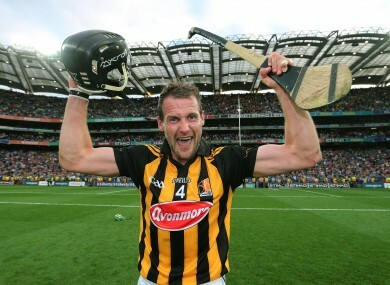 Feedback on “Kilkenny star Jackie Tyrrell is in awe of the Irish Super Bowl blaggers”.